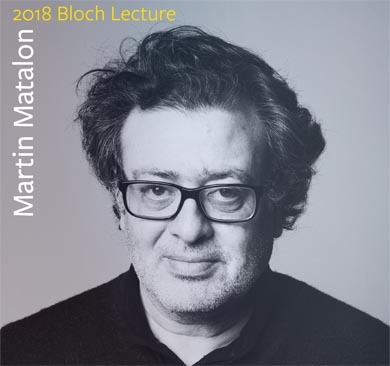 The UC Berkeley Department of Music, CNMAT and Cal Performances present Bloch Lecturer Martin Matalon. Born in Buenos Aires in 1958, Martin Matalon received his Bachelor degree in Composition from the Boston Conservatory of Music In 1984, and in 1986 his Master’s degree from the Juilliard School of Music. In 1989, having initiated himself in conducting with Jacques-Louis Monod, he founded Music Mobile, a New York-based ensemble devoted to the contemporary repertoire (1989-96). Among his awards, Mr. Matalon received in 2007 the « Grand Prix des Lycéens », in 2005 the J.S Guggenheim fellowship and le prix de L’Institut de France Académie des Beaux Arts, in 2001 the award from the city of Barcelona, the Charles Ives Scholarship from the American Academy and Institute of Arts and Letters (1986), a Fulbrigth scholarship to France (1988). In 1993, having settled in Paris, the composer collaborated for the first time with IRCAM and worked on La Rosa profunda, music for an exhibition at the Pompidou Centre on The Universe of Borges. The following year, IRCAM commissioned a new score for the restored version of Fritz Lang’s silent film, Metropolis. After that considerable work, Martin Matalon turned to the universe of Luis Bunuel, consecutively writing scores for three legendary surrealistic films by the Spanish director : Las Siete vidas de un gato (1996), for Un Chien andalou (1927), Le Scorpion (2001) for L’Age d’or (1931) and Traces II (la cabra) (2005) for Las Hurdes (terre sans Pain) (1932) .